The announcement was issued via press release this morning by the SSFL. The TT Pro League’s weekend fixtures were also postponed. 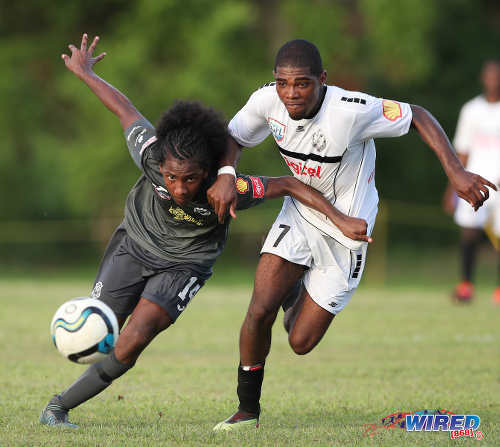 Photo: St Benedict’s College attacker Jaycee Paras (right) tries to hold off Presentation College (San F’do) defender Zion Allen during SSFL action in Marabella on 26 September 2018. However, there will be Premier Division action in Plymouth as St Benedict’s College managed to catch a flight to Tobago yesterday evening. St Benedict’s, who are ninth, play away to table proppers, Bishop’s High School, from 3:45pm. The newly promoted Bishop’s are four points adrift at the bottom of Premier Division and, with four match remaining, can be relegated by next weekend if they cannot pick up a few wins. St Benedict’s, on the other hand, can climb to as high as fourth on the 15-team standings with a handsome win today. 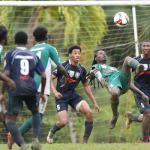 The SSFL executive has not set a date yet for the postponed weekend fixtures. On Monday, Queen’s Royal College play away to Trinity College (Moka) from 3:45pm in another rescheduled clash. QRC were edged 1-0 by San Juan North in midweek but were unbeaten in their last four previous fixtures. 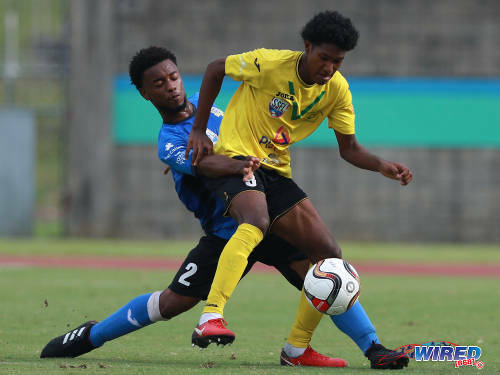 Still, they are just three points clear of the relegation zone at present—with East Mucurapo Secondary, Fatima College and Valencia Secondary over their shoulders. Trinity (Moka) are unbeaten in their last two outings and can climb above namesakes, Trinity College East, to fourth place with a win on Monday. 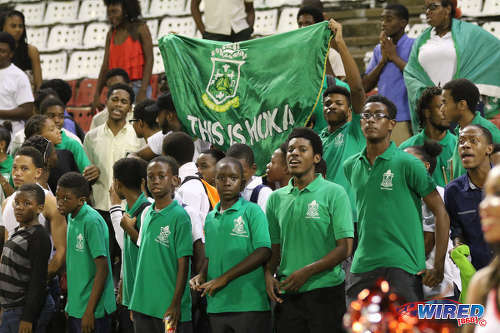 Photo: Trinity College Moka fans support their team during National Intercol semifinal action against San Juan North Secondary at the Hasely Crawford Stadium, Port of Spain on 30 November 2016. Valencia Secondary vs Fatima College, 3:40pm, Larry Gomes Stadium, Malabar. Photo: Naparima College midfielder Molik Khan (left) tries to escape from Bishops High School midfielder Ranaldo Johnson during SSFL action at Lewis Street on 3 October 2018. 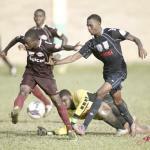 Bishop’s High School vs St Benedict’s College, 3:40pm, Tobago. Trinity (Moka) vs QRC, 3:40pm, Moka.